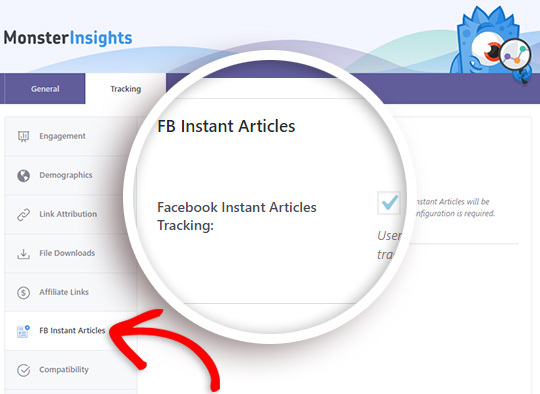 Easily integrate Google Analytics and Facebook Instant Articles with just one click. With Facebook Instant Articles, you can reach a whole new audience with your content. Your Instant Articles pages will load up to 10 times faster than standard mobile pages, making readers 70% less likely to abandon your content. But by default, Facebook Instant Articles doesn’t play nicely with Google Analytics. You may be getting more traffic to your Facebook Instant Article posts and pages, but it’s impossible to get detailed data when all your page and post titles are lumped together in your analytics. Now you can fix that with the new MonsterInsights Facebook Instant Articles Addon. With just one click, you can easily integrate Google Analytics with Facebook Instant Articles and get all the data you need on your mobile traffic. With your new insights into your Facebook audience, you can create a more data-driven social media marketing strategy.